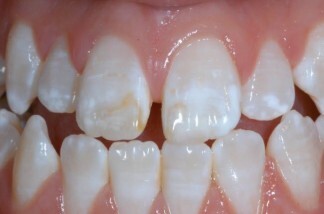 There are two ways in which teeth can become discoloured: intrinsic, which occurs during development of the actual tooth thus occurs on the internal structure of the tooth, and extrinsic, which occurs on the outer surface from external sources such as food and drink, smoking and bacteria. Ageing tends to darken the tooth. Intrinsic staining cases are harder to treat as the internal structure of the tooth is involved, changing the way in which light reflects on the tooth and so the colour of the tooth appears altered.